Labour's Kate Hoey talking to talkRADIO's Mike Graham on College Green, Westminster. Labour’s Kate Hoey has said that all the amendments on Theresa May’s Brexit deal are “meaningless” because they do not change the “legal status of the agreement”. MPs are set to vote on the Prime Minister’s Brexit proposals on Tuesday evening, with four amendments being voted on before the final vote. Read more: What happens if Theresa May's Brexit deal is rejected? The MP for Vauxhall told talkRADIO’s Mike Graham: “I will probably vote against all the amendments because I think they are all meaningless in the sense that they will not change the legal status of the agreement. “I would vote against it because as far as I am concerned it is disappointing. I am a strong Leaver, I wanted to leave and I don’t think this is really what people voted for. Ms Hoey described Labour leader Jeremy Corbyn as “astute” over his handling of the Labour position within Parliament. She said: “I think Jeremy Corbyn has been quite astute in the way that he has handled this so far because he has had to keep his party together. “It is divided, particularly in our Labour supporters out there. There will be a lot of pressure on him to go immediately for a vote of no confidence but there is not much point of going for a vote of no confidence if you are not going to win. “I don’t see at this point one single Conservative who would go into the lobbies voting against their own government. “The DUP will not, particularly if they have defeated the Withdrawal Agreement so I can’t see that happening. “I think some of our ardent Remainers want to see it happen and be defeated so that they can push for a second referendum or another option." 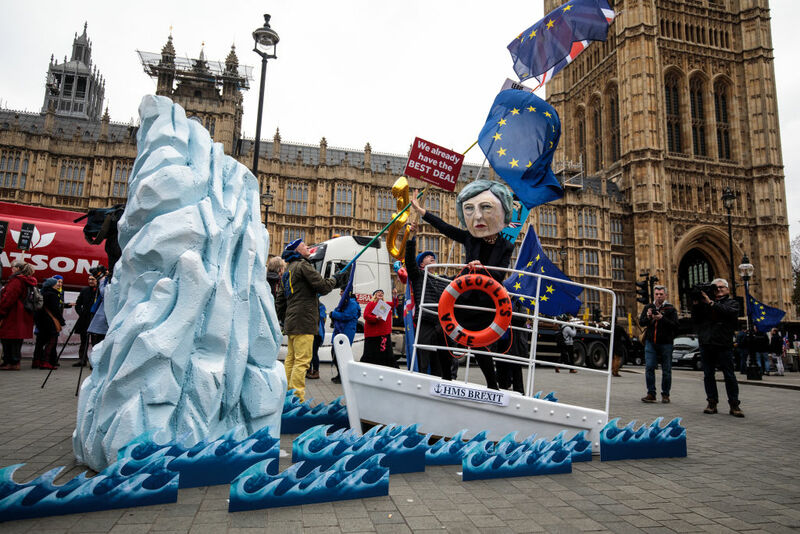 Anti-Brexit protesters outside of the Houses of Parliament as MPs prepare to vote on Theresa May's Brexit Withdrawal deal. The pro-Brexit MP said she did not expect the majority against the Prime Minister’s deal to be as large as predicted. “I don’t think it will be as big a majority as everyone is saying,” she said. “I think there will be a lot of abstentions and people tend to change their mind at the last minute. There is a lot of loyalty within a party always. “It just seems amazing that the EU could not have another little page with a bit of legal jargon that would actually stop the backstop and give an end date for it. “That would certainly help me to look at it again but there is so much detail in the rest of it that is actually allowing the EU to have huge control and we are going to be tied into an awful lot of the regulations that we may not want to have. It is too late now but we should not have started from here.